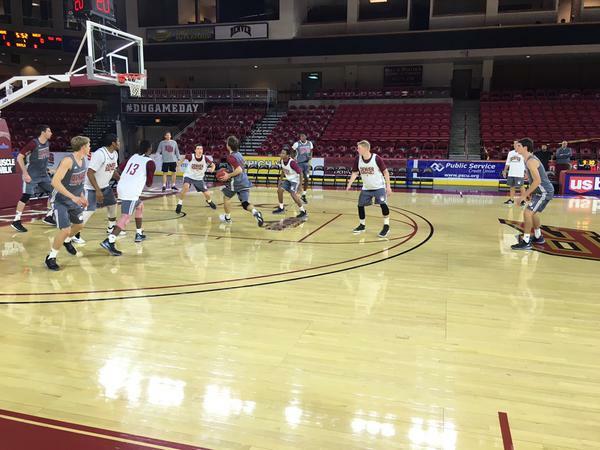 DU's basketball coaches aren’t accepting youth as a reason for failure this year. But one glance at the roster reveals that this team is young and inexperienced. They might even be the youngest team in D1 basketball. Looking at player development, playing style, coaching, and intangibles for this season we will take a guess at what to expect from the 2015-16 hardwood Pioneers. The most important overall issue this year is going to be the development and growth of the freshmen class. It won’t be a surprise if we see four freshmen starters. Adapting to Dl speed and pressure will prove to be a major challenge for these freshmen. Working together as a team and running the Princeton offense won’t be easy, either. Third, developing an identity with key players emerging to fill roles - rebounding, point guard, scoring, lock-down defenders, sixth man, etc.. Finally, identifying team leaders to control games and tempo during critical stretches is going to prove to be one of the most important challenges this young team will have to face. This year's recruiting class quality must be high because this class will make up most of the roster for the next few years. Any recruiting errors will potentially block better players from entering the program. If DU is ever going to push for a league championship, 1-2 players from this year's freshman class must become first team all-conference player(s) by the end of their career(s). Finally, assuming they develop as needed, they need to stay at DU for four years. The ultimate wheelhouse for this year’s freshman class is likely 2017-2018. DU's veteran big-men, Marcus Byrd, Christian Mackey and Daniel Amigo will have to control the paint and add veteran leadership up-front. Last season, DU was out-rebounded by more than 5 boards per game. Freshman “wild card" player, Abiola Akintola, a 6'6" player from Australia blew out his knee earlier this summer so his role remains unclear though it might be unlikely to see him at all this year. Nate Engesser (11 ppg) is a veteran scoring threat at the guard position and the much of the scoring responsibility will be on the shoulders of returning players like Pemberton, Douglas, and Dunn to pick up some additional minutes on the perimeter. If they don’t deliver, the new recruits will steal their minutes. The Pioneers run Joe Scott's Princeton Offense which has been modified over the course of his coaching career. The most important aspect of this offense is identifying a point guard to trigger the offense. 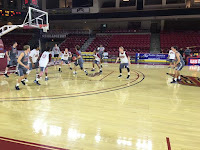 Then the team must address the question of whether the team will run when opportunities present themselves and/or shorten the time in their offensive end if good shots are available. Many fans may have forgotten that the Pioneers actually played fast break basketball in the Sun Belt Conference but have played a more deliberate style of basketball in the Summit League. Last year, the Pios only averaged 62 PPG - the program’s lowest scoring average in the last 5 years. The team has focused on conditioning heading into this season so this team can run when opportunities present themselves. Playing solid D1 level defense is always the biggest challenge for incoming freshmen. Can they harness their youth and energy to play smart, swarming team defense? This team will have to fight for rebounds, especially with DU's height disadvantage. While there are many different opinions about the coaching staff among Pioneer Nation, DU basketball sports 85-69 record over the past five years. Coach Scott is intense and is very hard on his player players – but so is Bill Tierney. It’s too easy to claim that this is the one factor that has driven the program’s declining performance. Recruiting has been a problem and players have left the program and ultimately that’s the head coach’s responsibility. While the Princeton Offense may be one of the best options with DU's talent, many fans want to see this team run when opportunities present themselves, shoot when shots are available (regardless of shot clock) and force turnovers. Young teams tend to think too much and play tight - so the coaches will need to allow them to make mistakes in order to maximize their success this season. All of this can be done in the Princeton system. There has been a clear decline in attendance over the past three years. In 2011/12, the Pioneers averaged 5,460 fans per game. That figure has dropped to a low last year of 2,366 fans per game. That’s more than a 50% drop. Some of the decline was league-wide while the marquee value of visiting teams, especially non-conference foes, was relatively low combined with declining team performance. Other fans see home-game scheduling as a key issue as early games, usually non-conference match-ups, are scheduled during DU’s winter break and road games scheduled during the quarter. DU’s senior class has seen a steady decline in basketball interest during their 4-years at the school. While the move to the Summit League was unappealing to many, home attendance at DU's other Summit League events such as soccer and volleyball has been relatively strong. Conference affiliation only explains one part of the declining attendance issue. Another question that this team will need to answer is whether this team will rally around each other. With relatively low expectations, this young team might not play with a needed chip on their shoulder; an important aggressiveness. As the season rolls on, fans will get a sense for how this team will play. We will look at scoring (PPG), defense (PPG), turnovers, starter's points, bench points, and rebounds in addition to the W/L record for each quarter. It’s difficult to win on the road in D1 basketball. For such a young team, even 3 road wins might be a stretch. It will even be difficult for this team to maintain Scott’s .800 home winning percentage. Anything around .600 at home would be strong for this young team. 8 wins at home would probably be a realistic expectation. Anything better than this projected 11-18 mark would qualify as a good season. This team’s focus shouldn’t be on its record. It should be on the season-long progression of this underclassman-heavy team. LGDU as always wants the best for our student-athletes so we hope this year's team exceeds our 'expectations'. Is 11-18 a fair projection? Would that qualify as a successful season to you? Let us know. We want to hear what you think. Nick, you, and others, continue to say DU plays, or is coached by Scott in, the "Princeton offense." Explain what this is. "Princeton offense" is mentioned a lot but I'm not sure people know what it really is, especially at DU. It's an easy out to say "Princeton offense." Personally I don't believe DU plays the "Princeton offense," or at least not correctly. DU's Princeton offense has always been derivative, rather than pure. The whole point of the Princeton is to work for mismatches to help equalize athletic ability. Joe Scott was a Princeton captain under coach Pete Caril, where he learned it, then was an assistant with Carril and has evolved his own version as a head coach at Air Force, Princeton and DU. Caril's version was predicated on disciplined ball movement that would ultimately break down a defense, lull them to sleep, distribute from the post and hit the backdoor layup on a blown rotation, or hit the open man for a jump shot. Traditional Princeton offenses rely on strong post players for distribution, but over the eight years at DU, strong post players are somewhat rare, so the ball moves a bit more on the perimeter. When Scott arrived at DU, he had was a more rigid Princeton offense. Very patient, lots of ball movement, backdoor cuts, and only taking the open shot. The theory was offensive efficiency that eliminates possessions for the other team. Since then, as DU athletes have evolved, Joe has given players more freedom to drive the land if the opportunity is there, and work the ball inside instead of just relying on the three point shot. With a younger team, I could see Joe moving back to a more systematic Princeton this year. The last comment was correct. Coach Scott even says he runs the Denver system - not the Princeton offense. Still, it is rooted in that system with constant motion, passing, back-door cuts, picks on and off the ball, and disciplined teamwork where players are interchangeable. In other words, based on floor movement a guard might be at forward or a forward might be at center. All players on the court handle the ball and have to be able to pass, catch, and hopefully, shoot. That is why you tend to get players that are 6'5" because they can generally do all three. The one element you do not see as much in the Summit League is back-door cuts because those teams are very disciplined zone programs with size and you do not see as much of that as you did in the Sunbelt. However, this team clearly has not been a isolation team, a quick shooting team, or a fast break pressing team over the past several years. That may change some this year, depending on personnel, but I expect they will be running a high-movement, high passing, pick setting, and back-door cutting offense. That is the Denver offense with most of the identical elements of the Princeton offense. Amigo and Mackey can handle the ball and shoot the 3? The preview talks about the freshmen, freshmen, yet none are named except for the one that's hurt. Why not mention freshmen by name? Who are the freshmen to watch? Awready - great suggestion. We will try to have a feature on the incoming players. Of course, we have two highly visible local Denver players in Thomas Neff & Jake Holtzmann. Then, C.J. Neff from Harket Heights High School in Texas. That school should sound familiar - Royce O'Neal went there. As I understand it, Royce has very positive feelings about DU and put in a good word about DU. Joe Rosga from St. Paul, MN was originally going to Army but had undisclosed medical issues and switched to DU. He was a stat-stuffer in high school. Bradley George has great numbers as a guard in Texas in 6A and led his team to the Texas State Championship finals last year. All our guys are 2-star recruits - typical for a mid major. But, this class looks very good to me. I have looked in on some morning practices and they are all working hard. I know the coaches believe this is their best recruiting class. We will need to research a couple of new freshmen guards - Sam Victor and Jacob Lunsford who do not show as scholarship players on Verbal Commits. Their CV's look solid, too. It is hard to predict how they will do as a group but, looking at the past, this group very interesting. I can't wait to see them play and develop together. We can't accept youth as failure because if we fail I'm out of a job! He won't be out of a job. His contract ends in 2018. DU isn't going to eat a million dollars to let him go just yet. Sam Victor played at Choate Rosemary Hall last year (a Conn. prep school) for a post grad year after high school in Texas. If Trump gets elected President, he should hire Joe Scott. That man is one great negotiator. It was pretty easy to negotiate a contract extension when the team had back to back 20-win seasons, a WAC title, and an NIT win and 5,000 people were coming to the games...Who wouldn't have extended him in 2013? "Who wouldn't have extended him in 2013?" Rush to judgment. Negotiate a contract in the last year of one. No reason to extend a contract when there's still time remaining. The team's done nothing since Scott got the extension. When you look at compensation for top coaches, DU has a relative deal when it was extended. True that it is at the top of the Summit now. The expectation then was that DU would become a leading mid-major and possibly move to a new conference. It looks like we are staying put for the short-term. Rather than waste energy arguing this point, let's hope we have some players coming in who are the nucleus of what DU needs to win the conference championship. At the end of the contract, both Scott & the AD have decisions to make. 1) For recruiting reasons, extensions tend to be extended when the team does well, so that rival schools can't say "Look (Inset DU recruit name here), Joe Scott's in the last year of his contract and may not be coaching by the time you get there...you should sign with us instead." 2) It's almost always cheaper for the school to extend earlier rather than later. That way, they always know their costs. DU doesn't have the physicality to do well in the Summit. DU players get banged around, especially under the basket. The Summit is a ban g-bang league and DU hasn't shown they can bang back. Amigo, the tallest player, is soft.